Thanks to the Olympics, we have been without Arrow for almost a month. And boy did it return with a bang! When we last left off, Oliver had his final confrontation with cyber-terrorist Cayden James. We finally got to learn James’ backstory and learn why he was on his warpath. Lucky for us, Oliver was able to stop him. This led to Laurel from Earth-2 shot and on the run in Quentin’s care and James in custody. 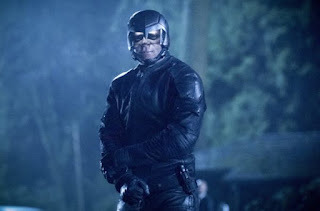 Unluckily for Cayden, one of his lackeys Ricardo Diaz, AKA Dragon, was playing him the whole time, and with the help of some cops in his pocket was able to kill James, so he now can take over Star City’s underworld. The episode begins with the fallout of James’ extortion. He previously had forced Oliver to use $70 million out of the city’s budget to pay him to not bomb the city. Now that James is dead, there’s still a $70 million hole in the city budget and would cause a government shutdown very soon. As mayor, Oliver has to deal with this fallout, and it’s something his vigilante abilities really can’t solve. He tells city officials that he will get that money back within two days. 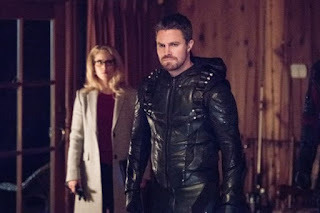 Oliver discovers that Earth-2 Laurel Lance has made off with the money, and in the aftermath of their battle, she’s not going to get too far with a gutshot. As Green Arrow, he should be able to track her down and get that money back. Oliver knows that the Outsiders are looking for Laurel and think that they have her, which leads to their inevitable confrontation between Team Arrow and the Outsiders. This has been a long time in the making. 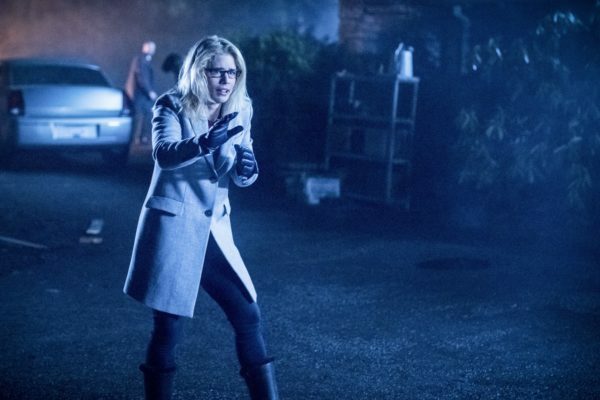 Ever since Renee was forced to turn states evidence in the case against Oliver, he had Felicity monitor his team members. This led to a breakdown of trust that eventually caused the team to splinter. While they carried a semi-mutual respect for each other, we all know this was going to eventually lead to a full-on confrontation. There are some rumblings of Marvel’s Captain America: Civil War in tonight’s episode. Both sides are right, both sides are wrong. Their inability to see the other side’s perspective and try and work to a compromise led to them to them coming to blows at the Outsider’s headquarters. Oliver realizes that they don’t have Laurel, but the damage is done now. Renee isn’t as dumb as Oliver thinks, and in their confrontation, he plants a bug on Oliver so that the Outsiders can track where he’s going. Thea finally realizes that Quinten has Laurel and tells Oliver. Laurel comes with a demand, help her leave the country and she’ll return the $70 million. Oliver decides that this deal with the devil is worth it and goes to the cabin to help her flee the country. However, the Outsiders know she’ll be there as well, leading to a second confrontation. Curtis even hacks Diggle’s chip, crossing yet another line between the two teams. Team Arrow and the Outsiders come to a full-on fight where they are not holding back. Renee and Oliver's fighting causes Renee to be seriously injured in the process, having devastating consequences for both teams. Dinah manages to track down an escaping Laurel and is about to deliver the killing blow, but Curtis talks her off the ledge, saying she would be no better than Oliver if she did it. 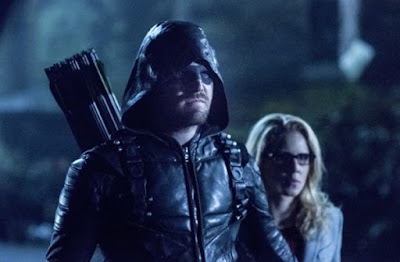 Laurel manages to use her sonic scream to escape as Team Arrow and the Outsiders go their different ways. In the hospital, it's revealed that Renee’s injuries were more serious than they previously thought. He will need to be transferred to a facility outside the city, so no more Wild Dog for the foreseeable future. Diggle and Felicity come to the hospital to show their respect, but Dinah and Curtis are having none of that. Curtis, who’s now the de facto team leader, puts his foot down telling Felicity that they will now have nothing to do with them at all. Oliver is also forced to address city officials telling them that he “failed this city” and is not able to recuperate the money. This means it will have more problems for the city. It’s also revealed that the District Attorney prosecuting the Oliver case is in the pocket of Dragon, so is the police captain. Laurel manages to escape and tells a local truck driver that she’s been kidnapped for the past two years, and tells her that he name is Laurel Lance, now assuming the role for the “real” Laurel who’s been dead for a while. Next week, we see the return of Rory, who needs Thea’s help. Looks like Speedy is officially back!